Write with style, use the best Cello Axis 0.7 mm Mechanical Pencil. Feel the fun of even scribbling, experience the joy of writing with Cello Axis 0.7 mm Mechanical Pencil. 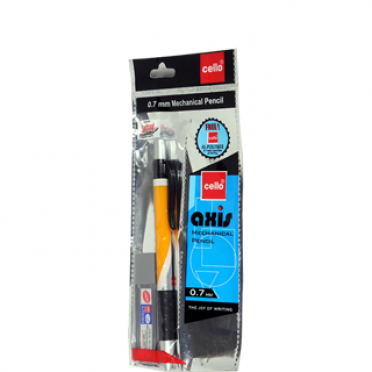 This Cello Pencil comes with the specifications that includes Opaque With Brand Foil, Grip and Nozzle Elasto Grip, Clip, Ring, Solid Plastic, Eraser On The Top With Transparent Cap. You can also avail 1 Lead Free Inside The Pencil Along with 10 Leads Tube Free. Buy this Mechanical Pencil offered by the very known brand Cello, which has got enough numbers of materials to help you with. Note : Minimum Qty : 10 pcs.